Have you been searching for a quality rototiller, that has plenty of power and an affordable price? Finding the right unit can be a challenge, as there are many options on the market today, and not all of them are well-made! In addition, if you prefer to save the environment by going electric, then your available choices dwindle even further. Luckily, the Greenworks 27012 10-Inch 8 Amp Electric Cultivator/Tiller is an excellent solution, as it has a variety of different benefits and features to commend it to you. First of all, it doesn't produce any harmful emissions, unlike gas tillers which contribute to pollution. This also means you won't be breathing in fumes while working in your garden, which is a nice added bonus! In addition, you won't have the hassle of buying fuel or refilling the tank in the middle of your project. Further, getting tune-ups will be a thing of the past, as you won't have all of the same scheduled maintenance to worry about. Essentially, if you've been looking for a rototiller that is stress free and good for the environment, then the Greenworks 27012 Rototiller is the machine for you. Yet, you may worry about its power capabilities, and if it can tackle your gardening jobs. 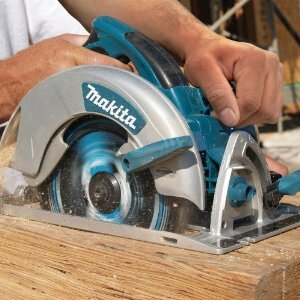 Many owners of this product are pleasantly surprised to find that its power surpasses that of their old gas-powered rototiller. In fact, it has been known to churn up large rocks, break through sizable dirt clumps with ease, rip through medium-sized roots and even take on hardened clay soil. The Greenworks 27012 Rototiller features 4 tines that chew up the dirt, which you can remove for easy cleaning. 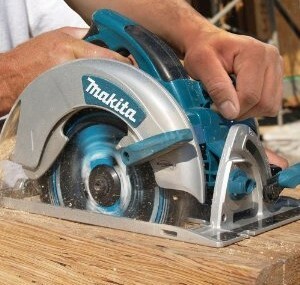 Also, you can adjust the tilling width depending upon your needs, to either 6.25 or 10 inches. You'll likely enjoy the cord lock as well, which keeps the electrical cord in place during use. Some customers have commented that this isn't as reliable as they would like, but this is easily fixed with a zip-tie. Finally, the depth of your till is fully adjustable, allowing you to select how far down in the soil you'd like to go. For the best results the manufacturer suggests that you remove any grass and weeds on the surface, and break up the top soil with a shovel. 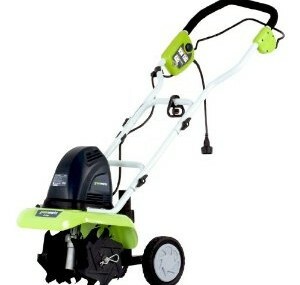 The Greenworks 27012 Rototiller will handle the job from there, allowing you to plant in freshly tilled soil! Also, with its compact size it is perfect for confined gardening spaces, as it has a smaller turning radius than bigger models. This rototiller also comes with a 4 year warranty, which is twice the industry standard. Greenworks truly stands behind the quality of their manufacturing, and you can expect your tiller to last for many seasons to come. People also love how a design which is more compact and weighs less than bigger units, can deliver the same level of power. This is perfect if you've been having trouble handling a larger machine, or the effort of using a heavier rototiller is becoming a problem. 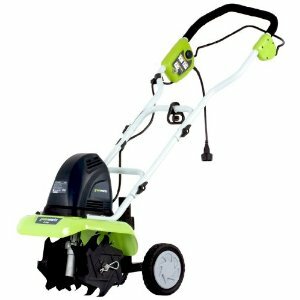 All in all, the Greenworks 27012 10-Inch 8 Amp Electric Cultivator/Tiller is an excellent value, giving you the most for your money. If you have a small to medium-sized garden and you'd like to lower your carbon footprint, then this is an excellent choice. You'll no longer have to deal with the problems associated with gas-powered units, yet you'll still enjoy the power and performance that the 27012 delivers.